The ThermaCELL PFHD-XXL Pro flex heavy duty heated insoles are the next step in revolutionary feet warming technology. Utilizing Bluetooth operation, temperature control is easier than ever using the ThermaCELL App on any IOS or Android device. Simply download the App on your smart phone and select between stand-by (no heat), low (90 degrees), medium (100 degrees) and high (111 degrees) to keep your feet warm without having exposed them to the elements. 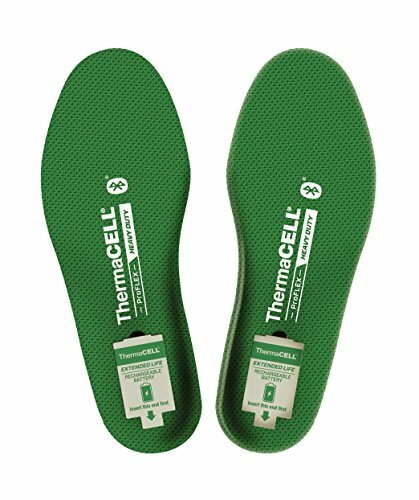 The ThermaCELL heavy duty heated insoles feature high capacity batteries that are 30% more powerful than the standard Pro flex batteries, and last up to 6.5 hours of warmth per charge. Using fast charge technology these batteries will charge up to 80 percent in just 80 minutes, meaning less time out of your shoe and more time keeping you warm. Having been tested to 1 million steps, these durable heated inserts are optimized for cushioning and stability to allow you to stay on your feet all day long. From the frozen peaks of the world's highest mountains to boston's high-rise construction sites during the dead of winter, ThermaCELL heated products have become essential equipment for extreme users. When people push the limits of the cold temperatures they can Endure, they count on heated insoles and heat packs to bring on the heat. Compatible Devices iOS Devices: Apple devices running iOS 9 or newer: iPhone 5, iPod touch 5th Gen., or newer versions of these devices. Andriod Devices: Running a minimum of Android 5.01: Nexus 5, Nexus 5x, Nexus 7, Samsung Galaxy 6, Samsung Galaxy 7, Samsung Galaxy Note 5, LG G5, Motorola Moto X.